4 Piece set. 16 inch, 4 wheel trims in a colourful box. 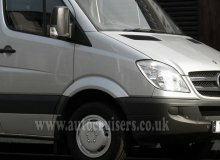 We have tried few 16 inch wheel trims on Mercedes Sprinter 2007 and found that this set fitted perfectly (as shown). We believe this set will fit most van wheels as long as the wheel centre is not sticking out too far. Unfortunately due to no model guide we will not be able to confirm, guarantee fitment and suitability on any model. If not suitable we will accept the return under our 14 days refund policy.